HP is among the world's largest IT companies, with nearly $100 billion in revenue from a portfolio that spans printing, personal computing, software, services and IT infrastructure. HP focuses on simplifying technology experiences for its customers – from individual consumers to the largest businesses. Making technology simple and accessible to potential customers in diverse cultures and language groups presents new challenges. For example, the QWERTY keyboard, based on the typewriter layout devised in the 1860's, is well-suited to English and other European languages with similar alphabets. But 1.5 billion people in India and Southeast Asia use phonetic language scripts with many hundreds of characters. HP's market penetration in these countries had been limited to the small percentage of the population able to write and transact business in English. HP's challenge: to create an alternative keyboard that would fit the more complex language script requirements of the untapped market. 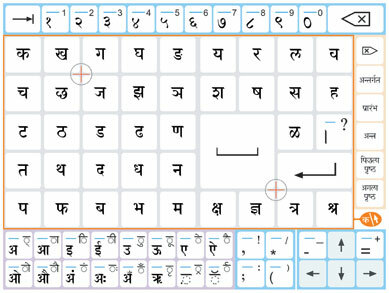 HP Labs in India created a prototype keyboard based on this subset of consonants and vowels. Gesture, or handwriting, recognition software allowed users to write directly on the keys with a stylus to modify any character as needed. HP called upon HFI to test the product and make it more user-friendly. HFI's strategy for successful user experience design calls for in-depth understanding of cultural conventions and expectations. The first step is research. HFI conducted studies with domain experts and thought leaders to get a better understanding of who, where, and why the keyboard would be used. The team interviewed writing teachers to research handwriting education, habits, styles and sizes. They conducted hands-on testing with users, compared it with other keyboard solutions, and conducted statistical analysis of the results. After iterative testing with school-age and adult users, HFI came up with a keyboard about half the size of the original version and a new user interface. HP's gesture keyboard was recognized by the Wall Street Journal's Technology Innovation Awards in the consumer electronics category. HFI's research-based refinements to HP's original prototype led to a final design that improved typing speed and ease of learning. The keyboard is pen-based because most new users are accustomed to writing with pen and paper. Since phonetic script is based on a relatively manageable set of base consonants and vowels, the keyboard included a separate key for each one of them. Since the base characters are starting points for the hundreds of modifications possible, each base character key is designed to function like a virtual piece of paper that the user can write on to modify. To produce a base character on the computer screen, the user simply taps the key with the stylus. If the base character needs to be modified, the user draws the modification on the base character key. The software reads the drawing and renders the modified character on the computer screen. Intuitive – The combination of keypad and stylus lets users create script in a familiar, natural sequence. The process is similar to the way writing is taught in school, so it only takes users about 20 minutes to learn to use the gesture keyboard. With a little practice, users can enter script at a rate of about 20 words per minute. Culturally Acceptable – Individuals in semi-urban and rural areas are now using the gesture keyboard for email, Web browsing, searching and document handling. It's also growing in popularity at public information kiosks and in government offices. 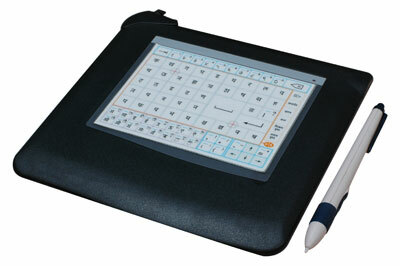 Adaptable – The gesture keyboard was developed first for Hindi and then Kannada, the language in India's Bangalore Province, where HP Labs is located. These two languages are used by 400 million and 44 million people, respectively. Marathi, Tamil and Malyalam versions of the keyboard are now also available, and HP is rolling out new languages at the rate of about one per month. Opening up new markets has invigorated HP's bottom line by developing a vast new pool of loyal customers. HFI was able to help the company meet its historical prime objective, "listening attentively to customers to truly understand their needs, then delivering solutions that translate into customer success." HP's revolutionary gesture keyboard won a 2006 Innovation in IT Award from NASSCOM, India's National Association of Software and Services Companies. The Wall Street Journal named the gesture keyboard runner-up in the consumer electronic category of its 2006 Technology Innovation Awards. It was recognized for making technology more accessible in emerging markets. HFI collaborated with HP Labs to refine the design of the Gesture Keyboard, a text input device for not English computer users. Based the success of this design, HP is rolling out new versions of this keyboard for different languages at the rate of one per month.